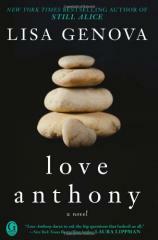 I was a copy editor for a long time, so the title LOVE ANTHONY bugged me at first. Is it a typo? Shouldn’t it be LOVE, ANTHONY? But as I got further into the book, I realized that leaving out the comma was intentional, giving the title a double meaning: It is both the closing of a letter from a loving son to his mother, and an appeal to the mother to love the son, no matter what. The imperatives of love are definitely the key to this novel. But here, love is mixed with science. Armed with a biochemistry B.A. 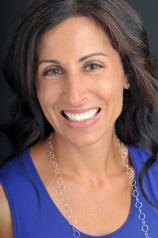 and a neuroscience Ph.D. (the latter from Harvard), Lisa Genova is in an unusually strong position to write credible fiction about challenging medical conditions. I was utterly engrossed by her previous book, STILL ALICE, whose protagonist, a respected professor, is diagnosed with Alzheimer’s at age 50 and must learn to redefine herself and her life. It is a mistake to reduce a person to her disease, Genova implies. A patient remains a person. "Sometimes trying to 'fix' a person is not the answer. Sometimes love --- by which Genova means total, unconditional acceptance, buttressed by a healthy dose of faith --- is enough. That is what this moving novel is all about." The same can be said of Anthony, the autistic boy in her latest book. Don’t get me wrong; there is no question that bringing up a child with this disorder is as agonizing an experience as a parent can have. Genova doesn’t skimp on the horrific details. At first, Anthony’s desperate mother, Olivia, is crushed and furious that medicine offers no real help (“My therapist thinks I should go on an antidepressant,” she writes in her journal. “I think this is some kind of perverse joke…. Anthony has autism, so give ME an antidepressant --- problem solved! How about a medication for HIM?!””). She and her husband try everything; they drain their bank account and their souls in a vain attempt to make their son behave like other children. Gradually, though, Olivia comes to accept that he isn’t normal and never will be, and that’s not all bad. She starts to realize “that happiness and autism could coexist in the same room, in the same sentence, in her heart….” Anthony can’t speak, but he has other ways of communicating --- flapping his hands; screeching --- and she doesn’t want to take that language away through the behavior modification his therapists prescribe. Her husband doesn’t agree, and when eight-year-old Anthony dies, so does their marriage. Two years later, she is living in their summer cottage on Nantucket, trying to figure out her next step. It seems a far cry from Olivia’s plight to her neighbor Beth’s more ordinary tragedy. Her charming but somewhat feckless husband has slept with another woman, and she has kicked him out. Now she is trying to decide if her marriage has a future. We follow both women as they recover forgotten talents. For Olivia, a former book editor, it is photography; for Beth, writing. Olivia’s new profession connects them midway through LOVE ANTHONY when she does a photo session with Beth and her daughters (she has made a specialty of summer “beach portraits”). Further links emerge when Beth gives Olivia her book manuscript to read, and in the end, the women’s journeys of self-discovery converge in a satisfying manner. However, given that the novel is told largely from Beth and Olivia’s alternating points of view, it is disappointing that these characters are not more complex or surprising. Sure, they are attractive, intelligent, gutsy women who serve the plot, but for me they never quite achieve a living, breathing presence, and their respective husbands are even blander. The best character is Anthony himself: Genova really makes you see this brown-eyed boy, with his love for Barney the purple dinosaur (a preoccupation his mother could do without!) and his passion for lining up the round white stones he finds on the beach. Sometimes trying to “fix” a person is not the answer. Sometimes love --- by which Genova means total, unconditional acceptance, buttressed by a healthy dose of faith --- is enough. That is what this moving novel is all about.